Salmon Dijon, Thyme for Cooking gourmet main course. We use fillets but salmon steaks will work. Add another 5 - 10 minutes for steaks. 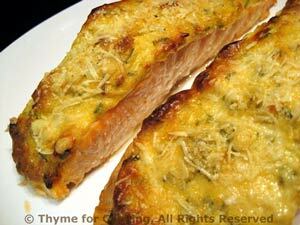 The mustard and cheese topping gets golden brown and the sharp flavor works well with the sweet salmon. Divide mixture evenly and spread over salmon.